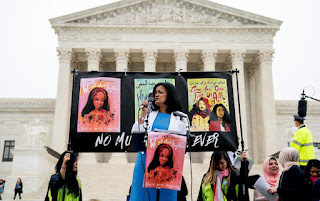 Rep. Pramila Jayapal, D-Wash, speaks at an anti-Muslim ban rally outside the Supreme Court as the court hears arguments about wether President Donald Trump's ban on travelers from several mostly Muslim countries violates immigration law or the Constitution, Wednesday, April 25, 2018, in Washington. WASHINGTON (AP) — President Donald Trump appears likely to win his travel ban case at the Supreme Court. Chief Justice John Roberts and Justice Anthony Kennedy both signaled support for the travel policy in arguments Wednesday at the high court. 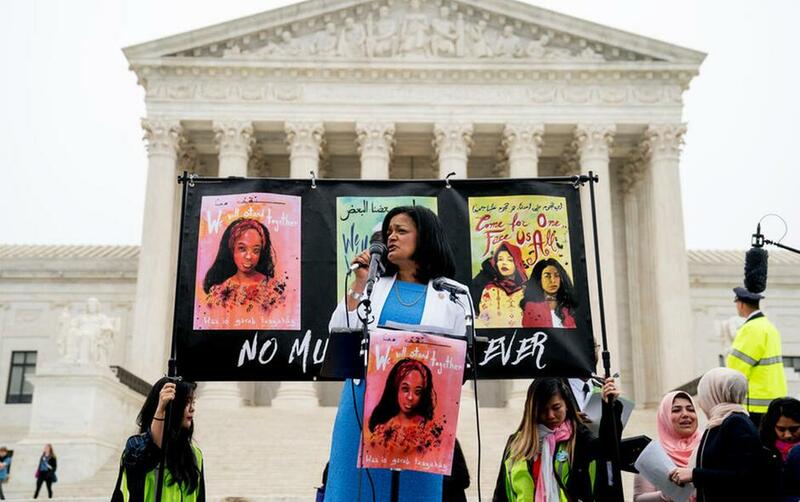 The ban's challengers almost certainly need one of those two justices if the court is to strike down the ban on travelers from several mostly Muslim countries. Justice Sonia Sotomayor was the most aggressive questioner of Solicitor General Noel Francisco in his defense of the Trump policy, and the three other liberal justices also raised questions about it. The justices voted in December to allow the policy to take full effect pending their full consideration. Wednesday was the first time they took it up in open court. The Trump administration is asking the court to reverse lower court rulings that would strike down the ban. The Supreme Court is considering whether the president can indefinitely keep people out of the country based on nationality. It is also looking at whether the policy is aimed at excluding Muslims from the United States. A decision is expected by late June. Kennedy challenged lawyer Neal Katyal, representing the challengers, about whether the ban would be unending. He said the policy's call for a report every six months "indicates there'll be a reassessment" from time to time. His only question that seemed to favor the challengers came early in the arguments, when he asked Francisco whether Trump's campaign trail call to keep Muslims from entering the United States should be considered in evaluating the administration's ban. Francisco told the justices that they shouldn't look at Trump's campaign statements. Kennedy pressed on that point. Speaking of a hypothetical "local candidate," he asked if what was said during the candidate's campaign was irrelevant if on "day two" of his administration the candidate acted on those statements. Francisco held his ground saying the presidential oath of office "marks a fundamental transformation." People waited in line for seats for days, and on Wednesday morning opponents of the ban demonstrated outside the court holding signs that read "No Muslim Ban. Ever" and "Refugees Welcome," among other things. In another sign of heightened public interest, the court was taking the rare step of making an audio recording of the proceedings available just hours after the arguments. The last time the court did that was for gay marriage arguments in 2015. The travel ban is the first Trump policy to undergo a full-blown Supreme Court review. The justices are looking at the third version of a policy that Trump first rolled out a week after taking office, triggering chaos and protests across the U.S. as travelers were stopped from boarding international flights and detained at airports for hours. The first version was blocked by courts and withdrawn. Its replacement was allowed to take partial effect, but expired in September. The current version is indefinite and now applies to travelers from five countries with overwhelmingly Muslim populations — Iran, Libya, Somalia, Syria and Yemen. It also affects two non-Muslim countries, blocking travelers from North Korea and some Venezuelan government officials and their families. A sixth majority-Muslim country, Chad, was removed from the list this month after improving "its identity-management and information sharing practices," Trump said in a proclamation. Trump's campaign pledge to shut down Muslims' entry into the U.S., his presidential tweets about the travel ban and last fall's retweets of inflammatory videos that stoked anti-Islam sentiment all preceded the justices' questioning of Francisco, defending the ban, and Katyal, the former acting solicitor general under President Barack Obama. The administration has argued that courts have no role to play because the president has broad powers over immigration and national security, and foreigners have no right to enter the country. Francisco also has said in written arguments that Trump's September proclamation laying out the current policy comports with immigration law and does not violate the Constitution because it does not single out Muslims. The challengers, backed by a diverse array of supporting legal briefs, have said that Trump is flouting immigration law by trying to keep more than 150 million people, the vast majority of them Muslim, from entering the country. They also argue that his policy amounts to the Muslim ban that he called for as a candidate, violating the Constitution's prohibition against religious bias.